A stock aircraft called Archon Crew Transport. Built with 101 of the finest parts. Original instructions suggested flaps (group 1) on takeoff, but they’re optional. Start pulling back gently at around 110m/s. Should lift off with little trouble. Gear up/flaps up by 150m/s. Run low and fast over the ocean. Accelerate until comfortably past Mach 1. Accelerate on your climb. Keep an eye on speed, as the drag profile isn’t the greatest. Generally if you keep your navball horizon at about 15 degrees (dropping it a touch as Kerbin curves away) it seems to be fine. Ride the air intakes as long as you’re still getting acceleration out of them. Once your velocity stops rising, close intakes and toggle the engines to closed-cycle mode (group 2). Aiming for over 1200m/s with changeover around 23km. Keep that 15 degree inclination until you’re into the upper atmosphere (40km or so), then set yourself to orbital prograde marker until AP is where you want it. Our example flight runs to 400km. Once clear of the air, open the cargo bay and extend solar panel and radiators (group 3, 4, 5). 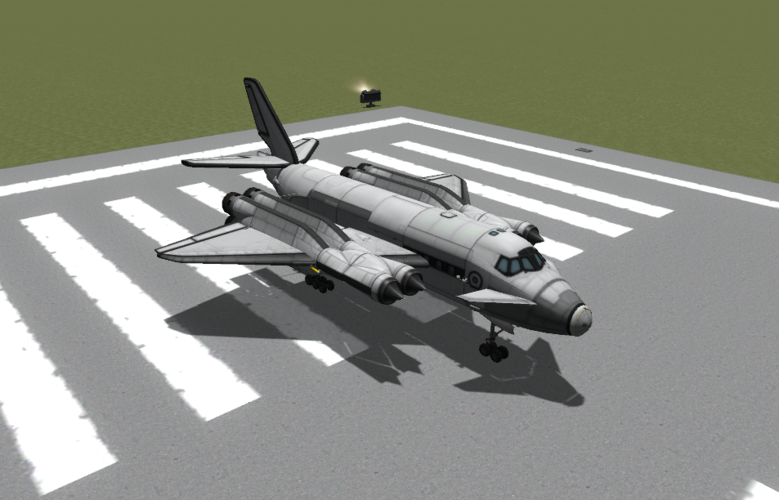 Radiators aren’t strictly necessary, but it’s something I’ve made standard on all my SSTOs. They pick up a LOT of heat from the climb, and if you’re only up for an orbit or two (say, to launch a satellite), that heat can hang around long enough to cause trouble on re-entry. Take care when circularizing. Thrust is almost-but-not-quite perfectly centered behind the CoM (the tail moves it up just a tad), so if you don’t have a 3-star pilot to be able to set hold on maneuver node, you may want to throw an advanced probe core behind the battery in the cargo bay. 400-500m/s left in the tank at our final orbit, depending on ascent profile (and deorbit from here is going to claim at least 200), so this isn’t quite the Archon’s flight ceiling, but accounting for orbital rendezvous, it’s close. Note that RCS is decently balanced, but somewhat underpowered. We’ve got overkill levels of monoprop onboard though, so just take docking slow and steady and it should be fine. Finding a simple re-entry profile from 400km turned out to be easier than I thought, A bit over half an orbit away from KSC, burn prograde ‘till your PE is around 30km. If you have the trajectories mod, just put your landing point just west of KSC itself. Bring in the deployables, (groups 5,4,3) toggle engine mode again (group 2) to open up the intakes, and set autopilot hold to Radial Out. This will keep the plane pulling up through re-entry. Your job is now to hold it level and pointing east. This may take a bit of wrestling through the early re-entry, but settles down once your AP drops below about 150km. Pop the airbrakes at about 35km. Watch their heat, but they should hold okay. Don’t worry if you bounce the re-entry and start climbing again; just ride it out. If you overshoot, you should have plenty of LF to turn around and fly home. Don’t worry about maneuvering on the turnaround. Once you’re subsonic, the airframe should be able to handle whatever you care to put it through.